If you’ve been following my last few posts, you would know my love (and slight obsession) for breakfast. And continuing in the series is this post of mine. 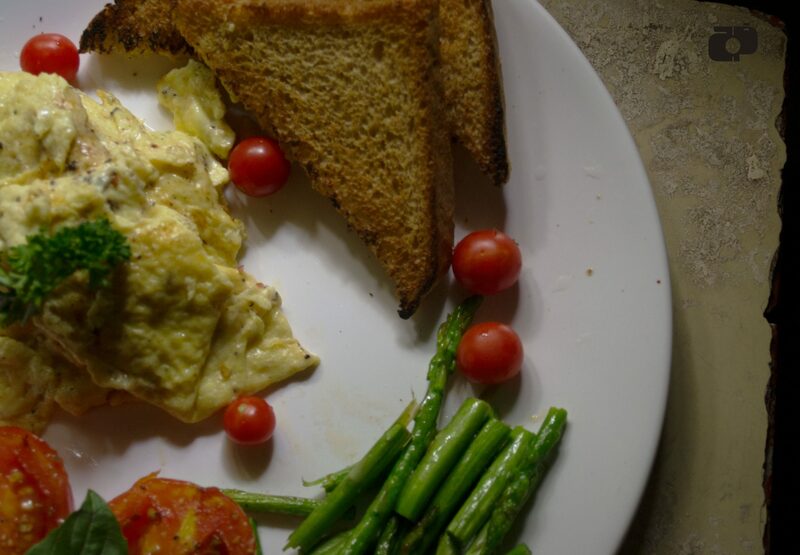 I am going to post delicious pictures of simple yet amazing breakfast recipes so that you get out of bed, head straight to the kitchen and make yourself and your loved ones the perfect meal to begin the day. I took to cooking eggs a long, long time ago, but for some reason never really tried scrambled eggs. 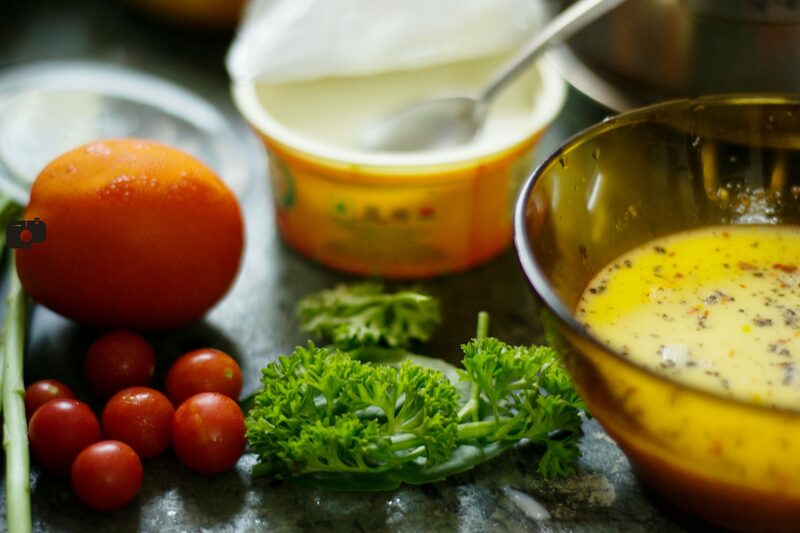 I was always an omelet lover, adding various ingredients to the omelets. Even tried poached eggs, that I still haven’t mastered but scrambled eggs, never. That was until recently. And I wonder why I didn’t try it sooner. 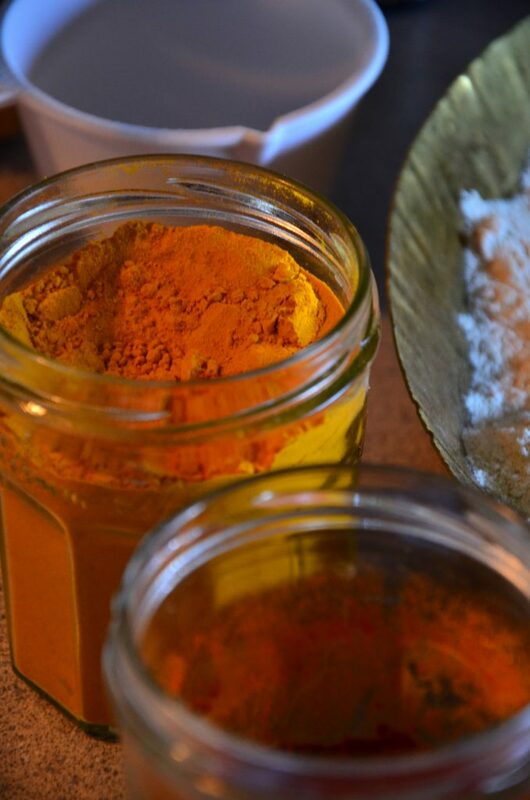 It is such a simple dish to make, so soft and delicious to dig into and versatile to pair with. The softness of the eggs was a discovery I was extremely pleased with. And being in Bombay, I splurged (rather went bananas) on grocery shopping, and so had some really nice and fresh Asparagus. To complete the meal, I added some roasted tomatoes. And that created the gorgeously colourful breakfast as you can see. I like my vegetables to be crunchy rather than completely cooked that shows in the pictures, they are only partially grilled and roasted. But if you like, you can cook them a little more, as much as you like. Once food is served to me, I can hardly wait to finish it up before it gets cold. You can imagine how fast this meal disappeared, thanks to the help from my partner-in-crime, my brother. What helps is that the dish also got his approval, and now I’m boasting a bit 🙂 I have recently come to believe, that cooking for more than yourself is sublimely satisfying. So here’s to more breakfast meals to be prepared in your kitchen. Would love to hear from you, on feedback, the helpful and not so helpful bits. Until then, here’s the recipe. Crack open the eggs and whisk them vigorously, this is the arm workout you were missing out on. Scrambled eggs are best made when you whisk the eggs thoroughly so that enough air is incorporated in them making fluffy scrambled eggs. Once the eggs are whisked nicely, add the milk, salt, pepper and whisk a lot more. You can even use a hand blender if you wish, but I whisked by hand alone and that was good enough. Add the cheese and whisk a little more. Meanwhile, heat a non-stick pan/ skillet and add the butter, I always add a few drops of oil to the butter so that it doesn’t burn. On medium heat, add the egg mixture and let the mixture sit until the bottom starts to set, do not stir until then. With a wooden/ rubber spatula, carefully turn in the sides of the egg to the centre, the liquid egg will come out from the sides. Repeat this, until there is no liquid egg left. You can now turn off the heat and gently stir and keep turning the parts to check if there is any uncooked eggs. Scrambled egg is almost like egg curds, and the trick is to keep the curds large enough. Tip: Scrambled egg is one dish that is more technique than anything else. 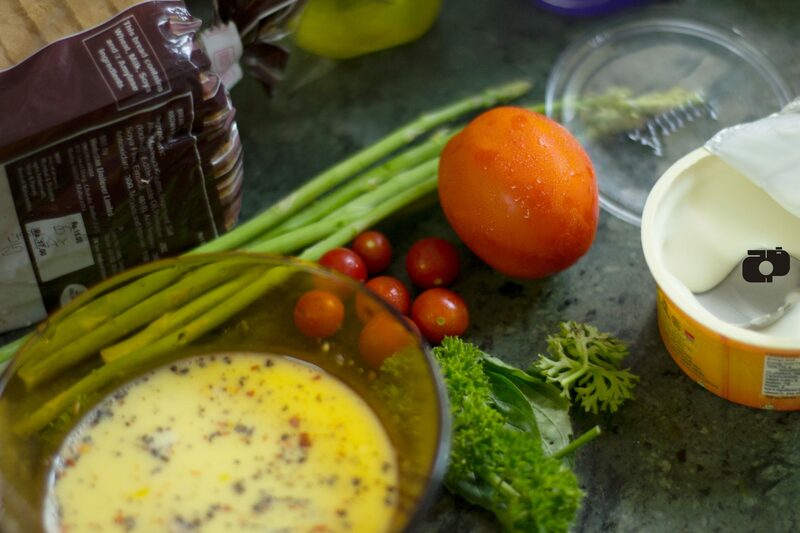 The utensils you use and how you use them will decide the dish’s fate. It is important that you use a non-stick skillet/ pan and a wooden/ rubber spatula. Also, it is important to turn in the egg with a light hand and not brown the eggs at all. Scrambled eggs are nice and moist and not brown which is burnt. Who wouldn’t want to wake up to breakfast like this? I am describing two methods here. You can either do this using an oven or you could roast these veggies in a pan. Take a bunch of Asparagus, wash them and cut them in 2cm length pieces. Halve two tomatoes and keep them aside. Meanwhile, set the oven at 170-190 degrees (depending on your oven) and preheat. Add the Asparagus and Tomatoes and rub with some Olive oil and sprinkle salt. Cook the Asparagus on grill for about 5-10 minutes turning it once in between. Roast the tomatoes for about 25-30 minutes depending on how roasted you want the tomatoes to be. You can also sprinkle them with crushed pepper, Italian seasoning and a little bit of sugar. 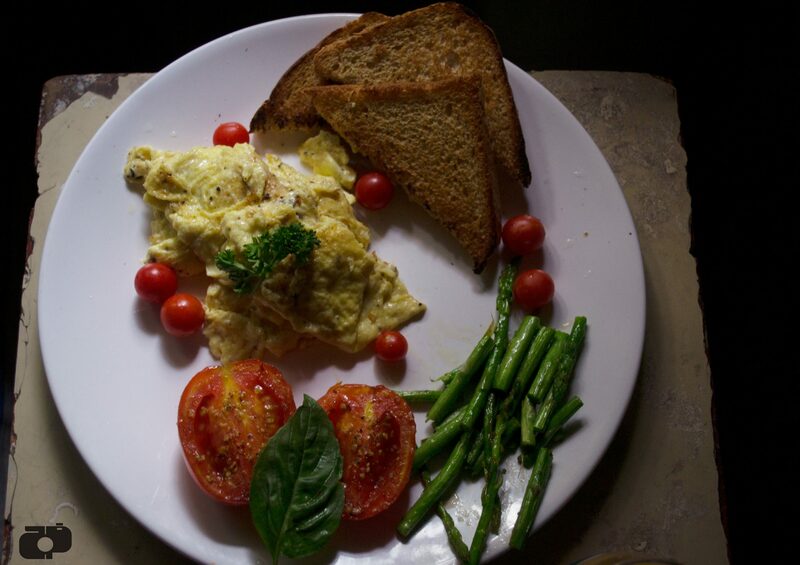 Gorgeousness on a plate – scrambled eggs! However, what I did with the Asparagus and Tomatoes was this. On a pan, add a little Olive oil, and cook the Asparagus, sprinkled with salt. Do the same for the Tomatoes, except keep the oil a lot more and then sprinkle with salt, Italian seasoning and crushed black pepper. This was a short cut I used due to the unavailability of an Oven. And it tasted just the way I like it. 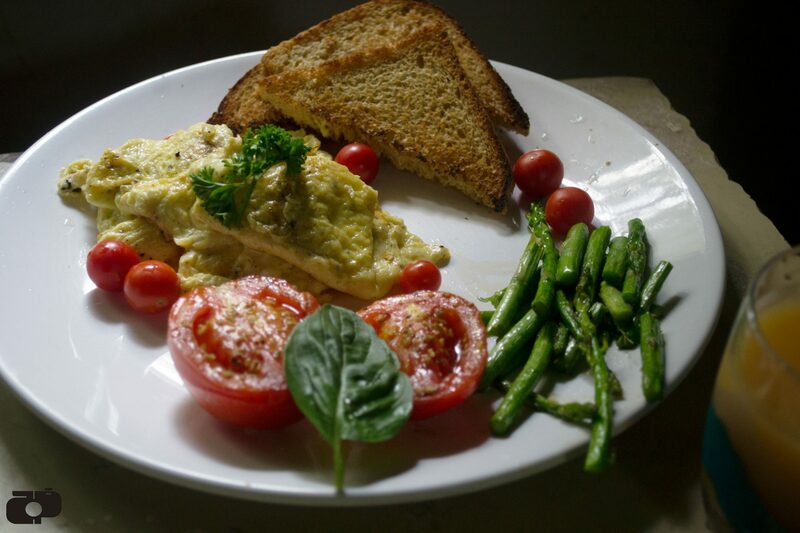 Set your plate and serve your scrambled egg with toast, and a garnish of Parsley and Basil leaves. 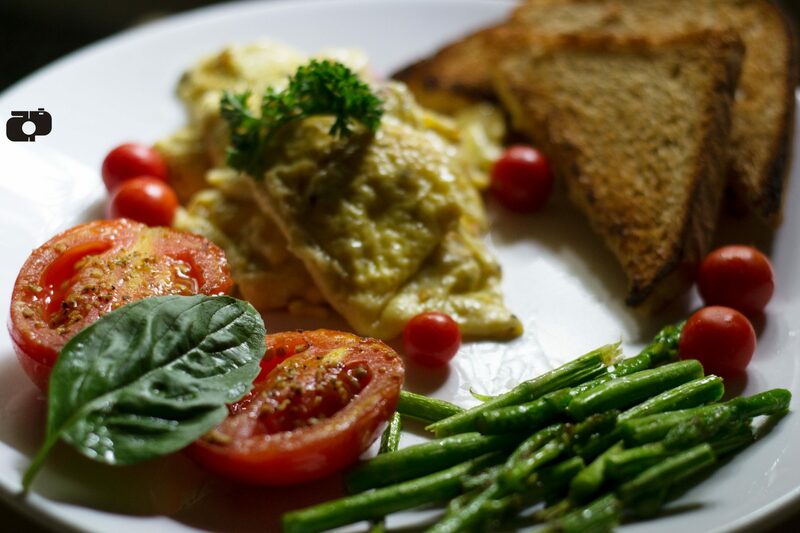 Delicious pan roasted Asparagus and Tomatoes served as a side to a succulent Scrambled eggs! Now if this wonderful looking meal does not get you to the kitchen, what will, I wonder. Until I come up with more Breakfast magic, happy cooking and happier eating! A loaded breakfast – Masala Dalia and Chaas!